Pedion: Journal #13 - oh, those beautiful new tiles! Pledge Manager (and extra pre-orders) are Live; lock your stuff! You will pleased to know that the pledge management system is up and running, and all backers have received an invite to lock their pledges. Almost half of them have actually gone and finalized their rewards already, so we are moving on! The Pledge Manager is set-up as part of the Pedion e-shop. This has another advantage: not only can backers add more last minute stuff to their pledges, but people who missed the Kickstarter have their (last) chance to pre-order Pedion Battlefield Sets! The Pledge manager will be open up to the end of the month, so not much time left to take advantage of Kickstarter prices and shipping. As many may know, we unlocked an awful large number of new themes, tile types and combinations during the Kickstarter Campaign. Because of the hectic rhythm of those days, we managed to create prototypes for only a few of them -those of the first Stretch Goals reached- like Green Grass Ponds, Craters etc. However, there were a LOT more stuff made available, mostly as extra options to the existing tile types, which we did not manage to show during the campaign but only to describe it. While we were mass-preparing tiles for the backers' orders, we also made sure that these unlocked options were implemented. 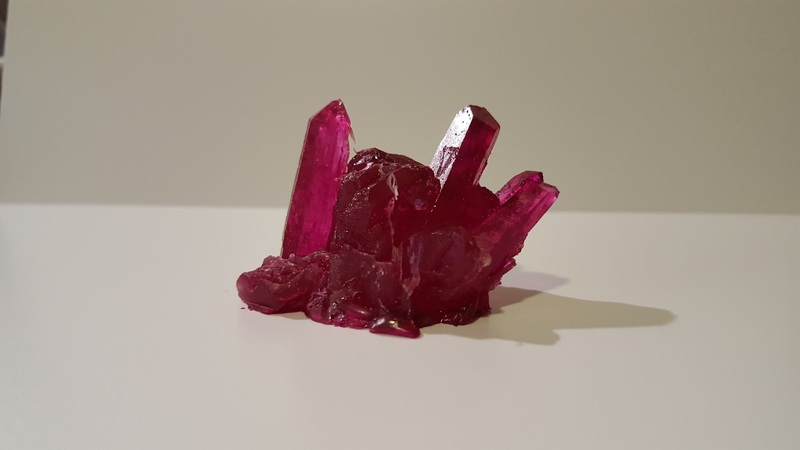 We wanted to have a picture of at least some of the new options available for the Pledge Manager, so the backers could have a better idea and base their choice in what they saw and not what they read. Another cool fact about the tiles/add-ons you will see below is that they are not mock-ups or prototypes - they are backer stuff. So, here are some images to see for yourselves, and we are very proud of how they are turning out! 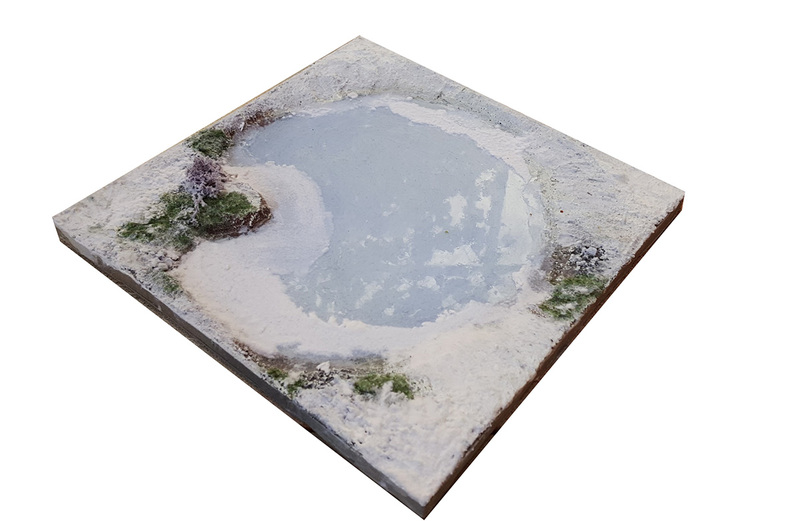 Frozen option for the "Pond" tile: a special liquid glass option for the Winter themed boards with a pond included. 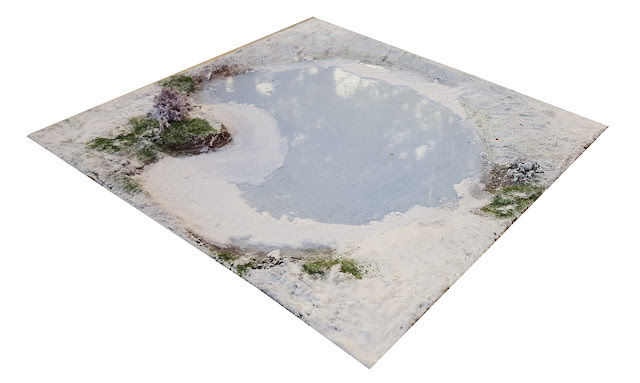 The pond is complete cast in epoxy resin. 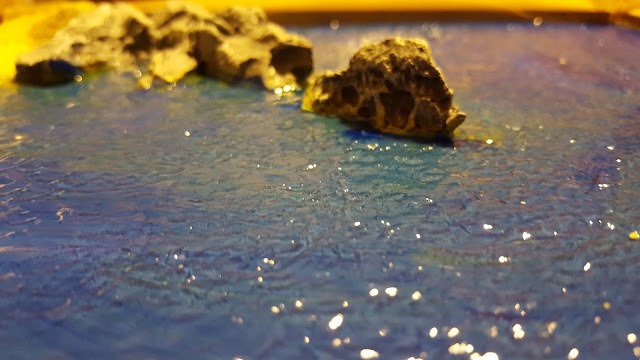 River with floating ice pieces: Staying in the Winter theme, another option of displaying the river surface was to add floating ice pieces. 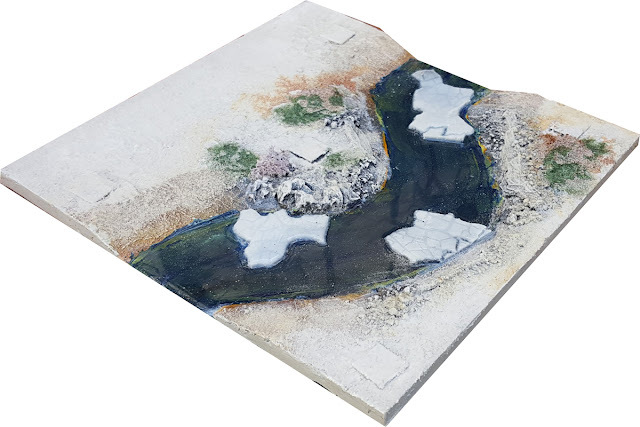 The idea is not to have a completely frozen river, but to show how cold it is, and perhaps assign some wargame attribute to the ice pieces (perhaps making the river passable?). Notice the darker blue/black of the winter water. 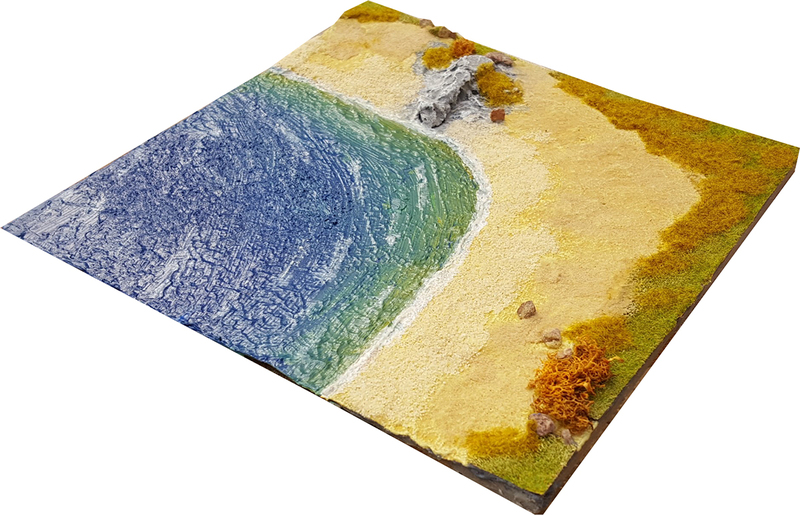 Now, to our pride and joy, the Coastline tile types. Coastline/Riversides were requested by the backers and unlocked close to the end. The Straight, Concave and Convex tiles will be of two types (2 different molds). 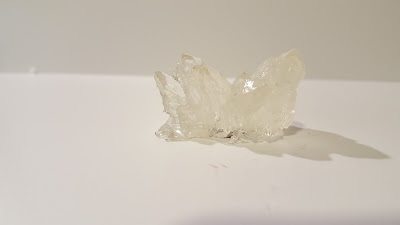 The delta and the open water of one type (molds in progress). 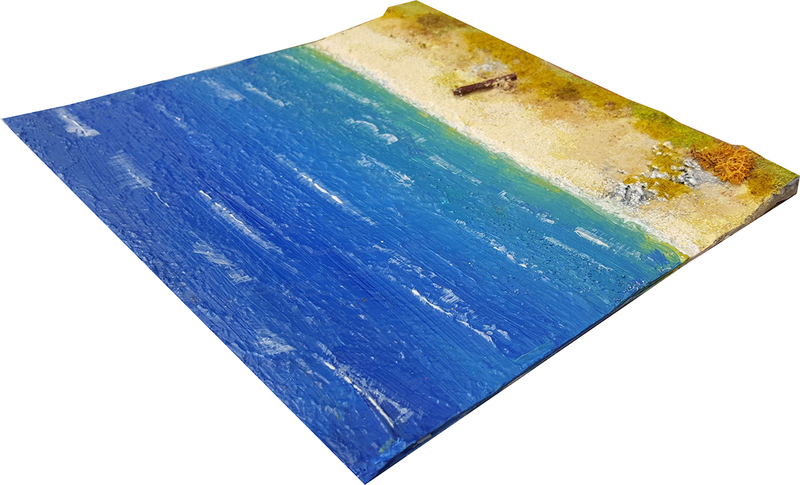 The tiles you see below are cast in resin or resin and liquid glass for the respective version. 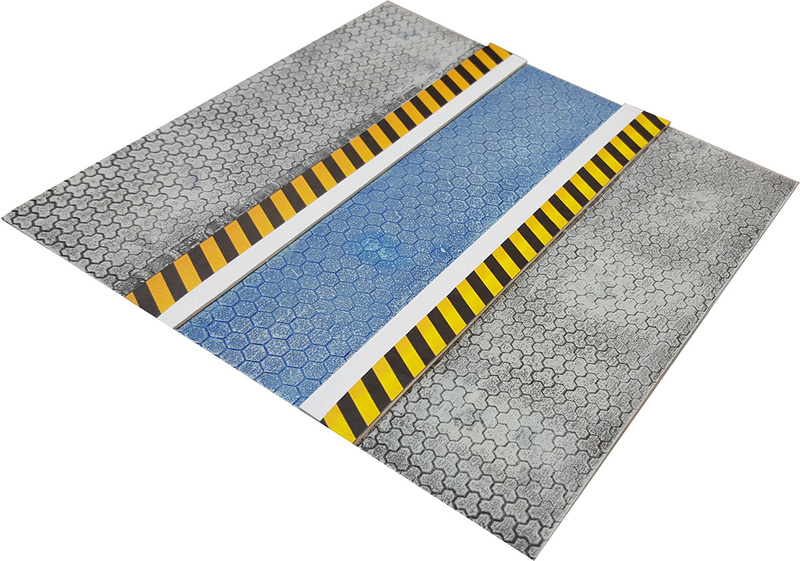 Also, the "water" tile sides also connect magnetically (we did not want to have to apply constant pressure on the tile corner by clipping velcro). 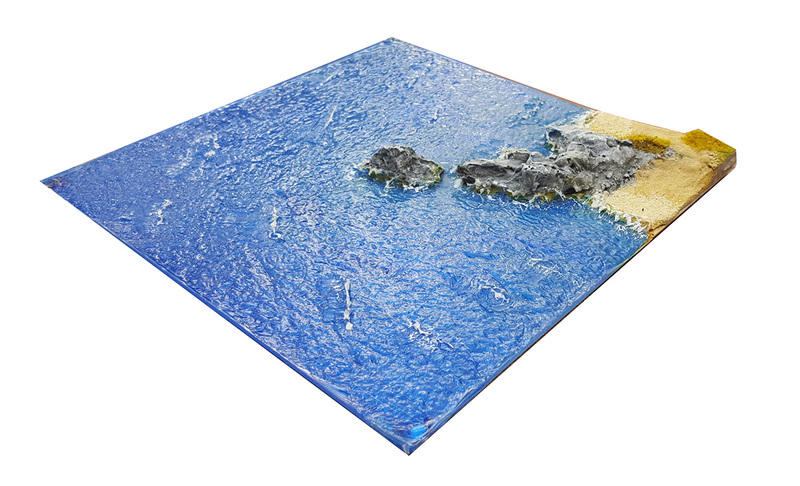 Also, ALL the sloped beach part is Magnetic, so players can snap walls, bunkers, artillery or anything else on them. Urban Road Tiles: about midway during the campaign, a stretch goal unlocked which is a personal favorite. 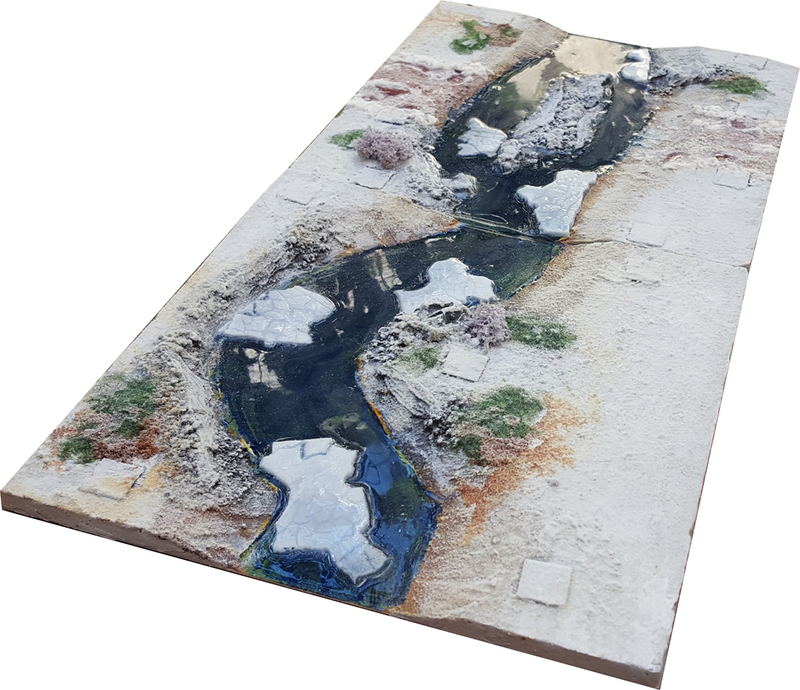 Now you can get a series of tiles to create a board of an urban environment, ready for man-made structures like buildings, ruins, factories, sandbags etc. Skirmish games become more and more popular and with urban tile options you could get the basis for a neighborhood, be it a fantasy village, a modern town or a futuristic off-planet settlement. 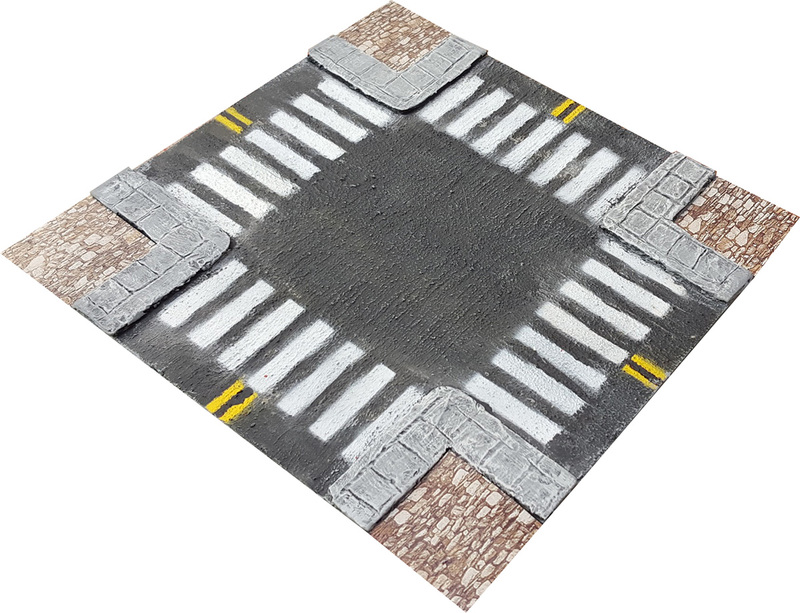 Backers had already seen our cobblestone/dirt road version, now we present two variations of the many available: a scifi straight road tile, and a 28mm modern crossroads tile. 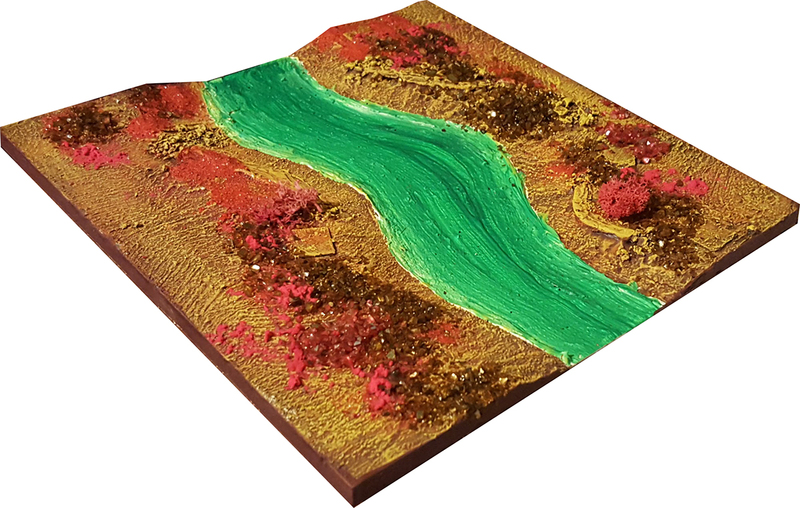 Variant River Flows: Along with the more exotic, scifi themes for our boards, unlocked two new "river" flows, lava and green toxic... stuff! These fillings can also be applied to fill craters, ponds or even "seas"/"lakes". 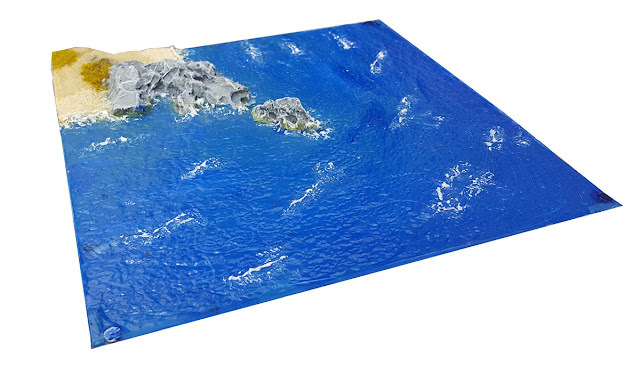 Check them on Grey waste and Red planet tiles. 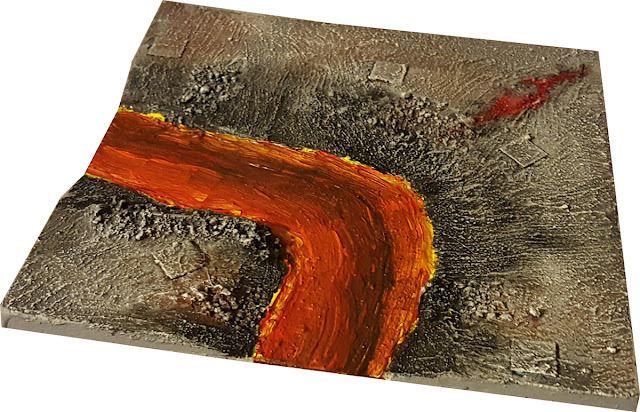 The Red planet tile has a more alien look with special minerals. Again, the square shapes are actual magnetic hardpoints. 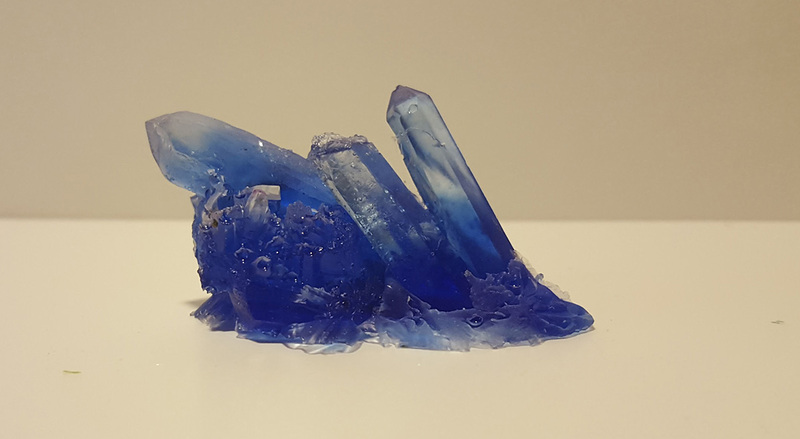 Sci-Fi Crystal Formations: even better than minerals, backers can now order MAGNETIC crystals which give a very scifi look on their boards. If they look realistic, it's because they are fully based on real Jade formations. 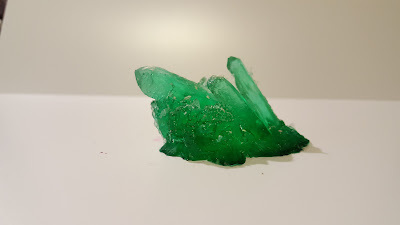 They are cast in transparent coloured resin, at various shapes. I have even more stuff to show you, especially the new Elevation change System we developed; but it will have to wait till my next blog post. If you liked the new stuff and the images, please share the word with people interested and -of course- get yourselves some in the eshop!